In the ongoing series, "weird Swedish fika"... no, let me start this over. Ok. Kladdkaka. That's essentially a brownie, and it's the first thing Swedish kids bake on their own. (At least I figure it is. It's easy enough.) 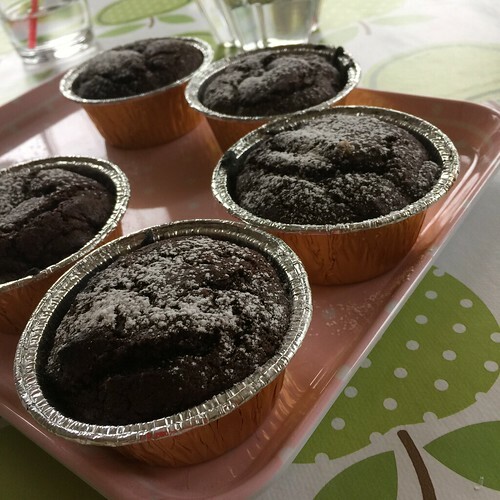 Someone figured that this wasn't easy enough, or not cute enough, and then used muffin tins to make "kladdkakemuffins" which translates to "sticky cake muffins" and is essentially.. brownies in muffin tins. Anyway. They're good. Make some. Serve warm, with ice cream or whipped cream. Crack the eggs in a bowl. Add sugar and cocoa and stir until smooth. Add vanilla, baking powder and flour, and gradually the butter. You'll have a thick, dark, batter. Spoon this into muffin tins - mine were made of foil but paper is fine too. Don't fill them all the way to the top - no more than 2/3. Bake at 200°. The exact time will depend on your muffin tin size, but I baked mine for about 12 minutes and they were perfect. They should not be too underbaked, but a little is fine. (But you're not making fondants.) Let them cool a little and they will fall in, creating a nice crater for your ice cream to sit in. Dust with a little powdered sugar if desired. And if you're feeling so inclined, a few berries are pretty on top.